Best of Three: How about trying best of seven? Guest Contributor March 7, 2018 4 Comments on Best of Three: How about trying best of seven? Best of three? What’s the point? In a doff of my cap to Daryl Selby and Cameron Pilley, I could call this piece Comment from the Balcony as that’s generally where I am at pro events! Much debate has raged in various places from changing rooms to Twitter and probably Facebook, albeit I am not on there, and in Squash Mad (and I hope readers will comment below on the game’s only truly independent website), about the merits of the best of three format being trialed in the current Canary Wharf Classic tournament. I will lay my cards on the table at the outset in stating that I was a sceptic. I didn’t have a problem with the experiment; I am all for change and trying new things, very much supporting the view that to grow, change and re-evaluation is necessary. My problem is that I have yet to see anywhere a clear objective. I won’t patronise readers with what a SMART objective is, but I will invite people to tell me what the objective is if they know, because I haven’t seen one and I don’t know anyone who has – readers feel free to disavow me of my ignorance. I am not alone. People have said things like, “it makes it more intense”. Really? I was there at the semi-final in 2010 between Nick Matthew and James Willstrop, the very embodiment of intense squash. Readers who have more experience than I can probably relate to others, but how do you measure intensity? So how can you know if something is more intense? The same argument goes for excitement, another oft-quoted aim (note not objective because again it can’t be measured without attaching heart monitors to everyone and even then, just as with beauty, it’s in the eye of the beholder). I accept that there will be less impact on players and that MAY be a laudable and worthy objective, I would simply question whether or not the impact on the very nature of the game is worth that when the changes in science and sport technology mean that players are extending their careers to the point they are virtually drawing their pension – only joking Nick! You need only to look at the top 20 and see the numbers who are still competitive well into their mid 30s and realise that in general the lifespan of athletes regardless of sport is extending and there is no evidence to suggest that it will change any time soon. Personally I am left with one argument that I am aware of and it relates to the Olympics and extending the audience beyond its current viewing catchment, perhaps in much the same way as T20 has done for cricket. I get that, I genuinely do, however, I am not convinced by the argument. One cannot in all seriousness state that the length of matches put people off. Golan v Cuskelly lasted over an hour, which is longer than many best of five matches, similarly compared to say tennis, golf or even T20 cricket matches are over quicker. My feeling is that actually there are two other things going on here that the squash authorities need to look at. Firstly, an internal one, the number of lets and strokes and interaction with referees and to be fair I think there have been significant improvements in that in recent years – a figurative round of applause probably ought to go to Lee Drew’s work here. The other is relating to the scoring and it’s about creating pressure points. Contrast with a sport deemed similar, tennis, and one that is definitely not, if it’s even sport, darts, both with significantly higher viewing audiences and associated coverage. In both there are considerably more pressure points. In squash I am always reminded of Jonah Barrington’s quote, “I never felt that the game really started until after the hour mark”. Whilst that has undoubtedly changed, the fact is that in aforementioned Golan v Cuskelly match one player was 5-1 up before the other rattled off seven of the next eight to make for an exciting climax, thus rendering previous rallies, whilst not quite irrelevant, certainly less important. In just about every event I have ever attended it’s the same. Where there is definitely a trend for the intensity of rallies etc to increase is when you get towards the oft quoted “business end”. To be fair, best of three addresses that to some extent in that it’s dangerous to let even a single game drift away, but from my first-hand experience it certainly didn’t increase the intensity of every point – would Pilley’s dive happened at say 3-1 down in the first? Perhaps, then, the experiment should be best of seven games, playing PAR to seven? Doing the maths (and I am sure someone with more resource and time could be more accurate on average pro points in matches) if, excluding tie-breaks, which are in themselves exciting, a conventional five-game match went to five-all, and ended 11-9, that’s 100 points, best of seven with all going to 7-5, goes to 84, a 16% reduction in athlete wear potentially, but an exponential increase in “pressure points”. It’s just a thought and I am sure there are readers who are significantly brighter than me who can come up with better ideas, but my point remains the same. I am unclear what the objective of Best of 3 and how we can objectively measure its success – just because it “feels” better, doesn’t mean it is, even if we can quantify “better”. The mix and match model used by some e.g. use it in lesser tournaments, or qualifying MAY have some merit, but as I see it only some. I will end with perhaps a more profound thought. By common consent, when PAR was introduced by the WSF it was NEVER meant to be incorporated into the amateur game, yet I can’t recall the last time I played HiHo. I have been playing for 13 years and have rarely played it. So if Best of three is incorporated into the amateur game, and it will be whether we want it to or not as the pro game is the shop window which is then subsequently mimicked by the majority of player, then what happens in clubs up and down the country where three fifths of the court time is used? Virtually all sport at amateur level, and squash in particular, is played for the social aspect. How different will that side of it be after a quick game of best of three against a gruelling best of five, when both players feel they need a drink afterwards? Thanks Paul. I too have doubts that Bo3 should be fully adopted in the pro game, however much I feel it works in the World Series Finals. part of the reason for its success there is that it is not the only difference in that event to a “normal” tournament – the best of three matches are incorporated into a round-robin group. The very fact that the World Series Finals has a different format entirely is a major factor to why it works so well. I think trialling Bo3 in the qualifiers and the early rounds at Canary Wharf was a good idea and I am glad that people are enjoying it. I can see that there is a place for this kind of event. But if you reduce opportunities to pull back from a losing position, remove the need for that mental and physical fortitude needed to grind out a 3-2 and constantly hand the advantage to a certain type of player then I think the game would ultimately lose more than it gains. 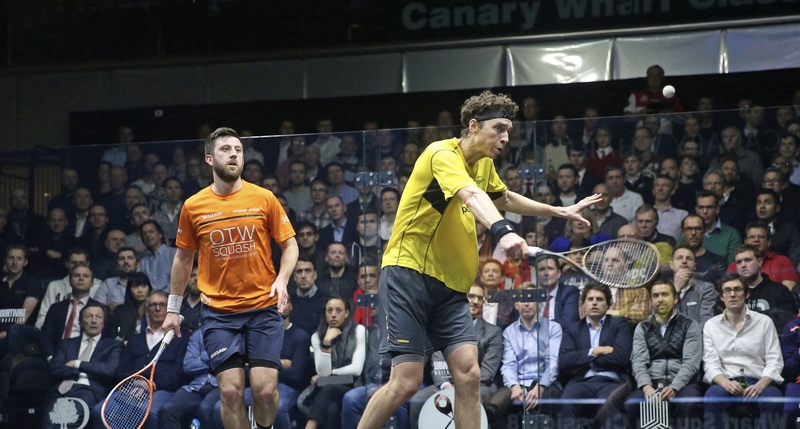 Some good thinking by Paul, firstly in applauding the Canary Wharf organisers for the courage in their experiment, but notably in crystallising the notion of pressure points in squash. 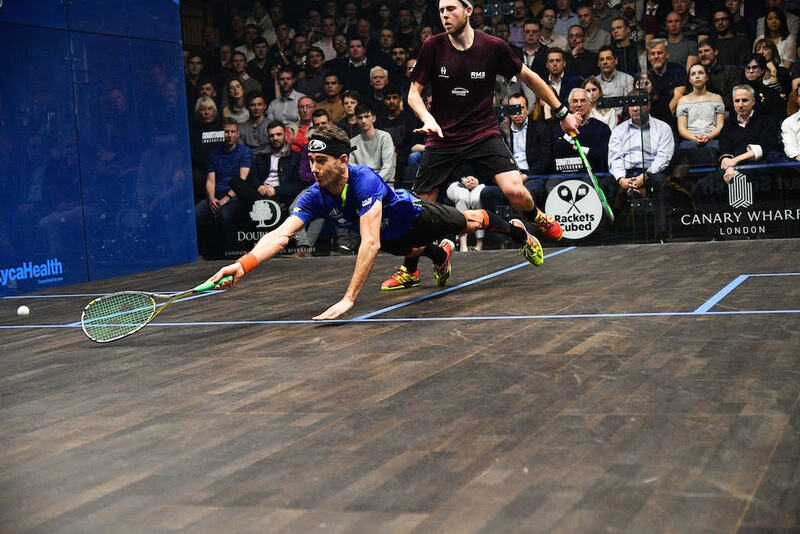 A more exciting scoring system would be a major component of turning pro squash – televised pro squash with major sponsors – into the exciting spectacle that would attract recreational players and general sports fans… and complete a package that would be irresistible to the organisers of the Olympic Games. The other two components of transforming squash into a sport of the 21st rather than the 19th century relate to the televising. Firstly, in spite of the expense, the camera angles need to change and increase, with a preponderance of views, front wall, side wall and high above one side wall at the back, that show the movement and the players’ faces. How often do you see a photo of the back of a player’s head? How often on TV do you actually appreciate how far and how fast a player is moving? The standard central view from high behind the back wall, which deadens the watching experience for non-squash players, should be used sparingly. The BBC’s coverage of the 2014 Commonwealth Games, with not just one but three front wall cameras, was a move in the right direction. Secondly, with modern tracking technology for the players and the ball itself, there are huge opportunities for information on the game as it develops, how far each player is moving, perhaps indeed, Paul, their heart rate, the pace of the ball, shot selection and so on. Detailed and fascinating stats about player characteristics would evolve. The last piece of that jigsaw should be the scoring system. An even more radical change than Paul envisages would work to give still more pressure points, more excitement, and more fans’ bums on the edge of their TV seats. The details need discussing, but say nine games of first to five points, with sudden death at four-four. With this scoring there’d be no games thrown: a player would still have a chance at 0-4 down. The tension at 4-4 would be electric, and would potentially occur every five or six minutes, and potentially nine times in a single match. Putting fan bums on TV couches is the route to the long term development of the sport. Changing the scoring system again, moving on from the grind of five games, PAR to eleven, should be an essential part of it. Look at these significant changes that were introduced for this year’s Next Gen Tournament featuring the very best players in tennis. Not ready for tour yet but they were widely seen as improving the game. Squash needs to think this big. • At the 2018 Next Gen ATP Finals, for the first time in men’s professional tennis, video review was available to further analyse judgement calls from the chair umpire, including the following incidents: double bounces; foul shots, such as a double hit or a carry; touches – when the ball might skim a racquet or clothing; and invasion – when the player, or anything he’s wearing or carrying, makes contact with the opponent’s side of the court while the ball is in play. Players were able to challenge any such calls.